Quality stitched & handcrafted, this 16-inch messenger bag is durable, spacious & made of 100%, genuine leather. Eco-friendly & stylish. Plus, wear it multiple ways. A must-have for school or office. 100% Authentic: Average leather messenger bags are cheap & fake, but yours is handcrafted with genuine goat leather. Rugged, eco-friendly & affordable. Stylish Design: Have a boring briefcase? Not anymore. 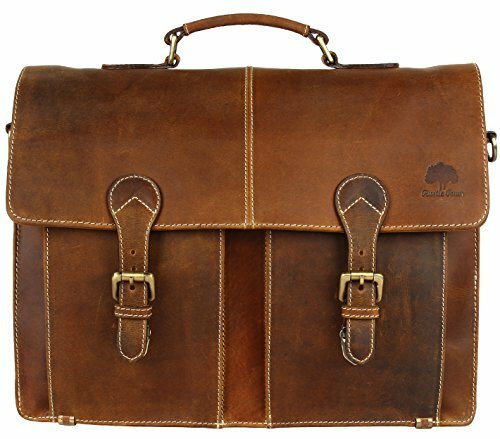 Your leather business bag has raw character that improves with age. Oil rubbed & distressed, it's vintage at its best. Built to Last: This leather satchel features quality stitching, brass buckles & strong zippers. Ultra-durable, reliable & secure. Even has heavy-duty canvas & Velcro strap to protect contents. Keep Essentials Handy: With 2 spacious compartments & 2 pockets, your 16-inch shoulder bag is perfectly sized for tablets, laptops, notebooks & more. Ideal for office, college & school. Multiple Carry Options: With a convenient, adjustable shoulder strap & sturdy handle, this brown laptop bag can be worn on shoulder, cross body or in hand. Great for bikes & buses.